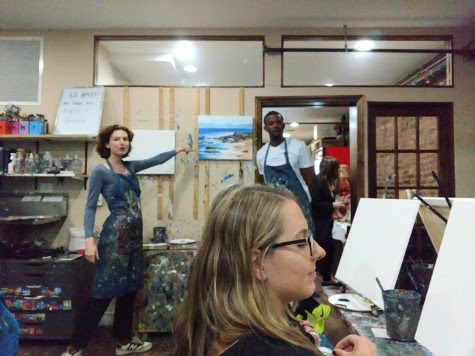 It's not every day I get a chance to learn how to paint, while sipping wine and hang out with a few blog buddies. 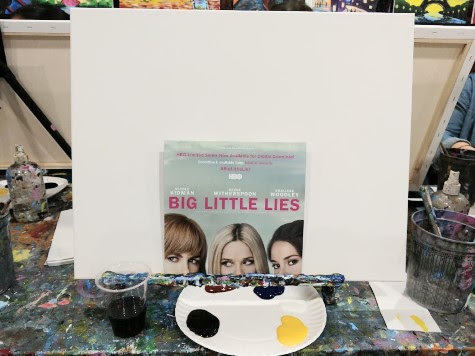 Note: I was invited as media and received a complimentary paint class and HBO #BigLittleLies digital release for review purpose. However, any personal views expressed are always 100% my own. But during a special HBO hosted event at the Painting Lounge in Midtown, I did exactly this to celebrate HBO Big Little Lies series being available for digital download this month! FYI, soon to be out on Blu-ray/DVD on August 1st. So about learning to paint. 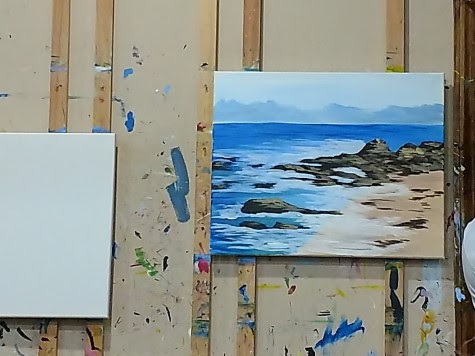 To be honest, I did take a few painting classes but that was MANY years ago. So I was excited to tie on my smock and sit before a blank canvas. While sipping on some whine of course! We received step by step instructions on how to start our painting. Then how to add texture and movement to our sky, and then water, then rocks and sand. If we got stuck, which I did with my rocks a few times, someone came over to get us back on track. Speaking of tracks. 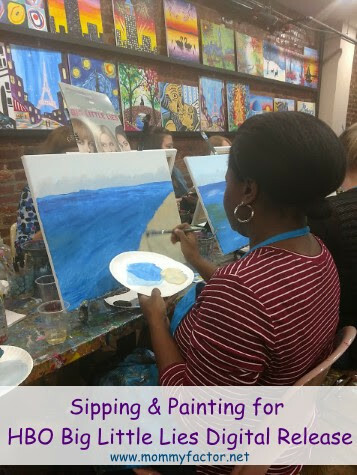 While we learned, sipped and painted we listen to tunes from the Big Little Lies: Music Soundtrack. The songs really helped set the tone for a night of fun with the ladies (and the few guys). I found myself humming along when I heard a familiar melody. 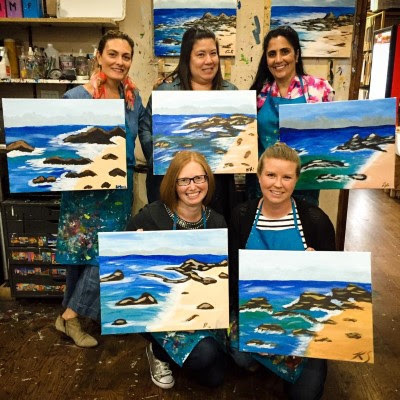 While I was hoping to share my finished painting, I can't because I was busy chatting and giggling with my blog friend Denise (Boyz Rule Our World), Kristen (My Strange Family), Milena (Be Your Best Mom) and Brianne (Stroller in the City). Then I had to leave early to get back to the kid. Oh well. But I can share that I enjoyed myself and it was a great way to spend the night celebrating HBO Big Little Lies digital release! Big Little Lies is based in the tranquil seaside town of Monterey, California, where nothing is quite as it seems. Doting moms, successful husbands, adorable children, beautiful homes: What lies will be told to keep their perfect worlds from unraveling? The cast also includes, Alexander Skarsgård, Emmy®-nominee Laura Dern, Adam Scott, Zoë Kravitz, James Tupper and Jeffrey Nordling. Big Little Lies is written for television and created by David E. Kelley (seven-time Emmy® winner for “Picket Fences”, “LA Law”, "The Practice” and "Ally McBeal”; “Goliath") and directed by Jean-Marc Vallée (“Dallas Buyers Club”; “Wild”; “Demolition”). ABKCO Music & Records has release Big Little Lies: Music From the HBO Limited Series digitally in March and will release it on CD (June 30), and vinyl on (July 28). The album also includes “The Wonder of You" performed by Villagers, Daniel Agee’s take on “How’s The World Treating You” and “Don’t,” performed by cast member Zoë Kravitz. Entries must be made on or before 11:59 p.m. June 28, 2017. I LOVED this series! I would gift it to my sister. I love the show and its soundtrack is so good - thanks for the chance! I love the show and would love to hear this sound track! Reading the book and loved the HBO show. WOuld love to listen to the music closely.